The Dividend Drive: Church & Dwight (CHD): Attractively Valued Despite First Appearances? This is one of those rare stocks that at least so far, you can buy pretty much anytime, and if you hold for a few years or more, you come out with a very nice rate of return. Could it be, however, that despite first appearances it is an ideal time to pick up shares in this consumer defensive star? Here I take a look at three valuation methods and see what fair value prices come out of them. Let's get started. 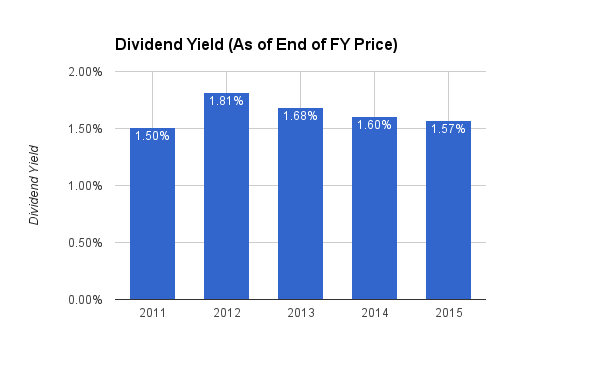 Applying this 1.64% historic yield to the $1.35 dividend in 2015 would suggest a fair value of $82.55. Yet this does not tell us the whole story. Analysts expect the dividend to grow to $1.42 per share in 2016. 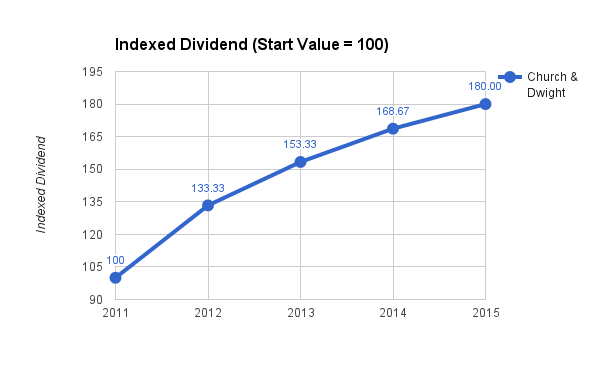 Applying the same 1.64% yield to this future dividend projection suggests a higher fair value of $86.83. Consequently, based on dividend yield valuation Church & Dwight is currently noticeably overvalued. Calculating our PE fair value we need to average the analyst consensus EPS predictions for the next two years ($3.53 and $3.81). 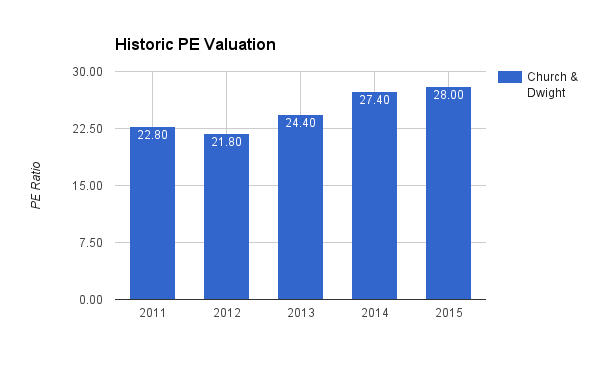 Using this figure we then multiply it by the historic PE valuation Church & Dwight has recently attracted. Doing so offers us a PE fair value of $93.83. 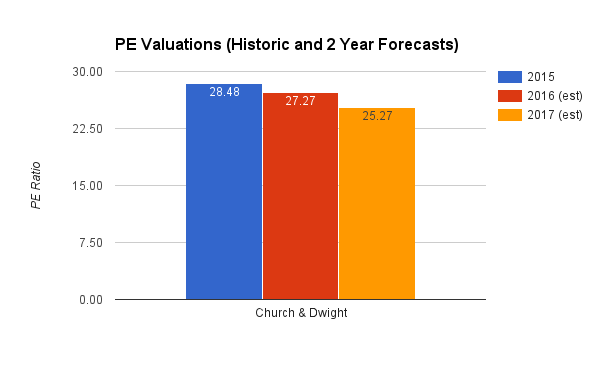 Again, based on PE multiples Church & Dwight therefore looks a little expensive. Yet it is less so than from a dividend yield perspective. 20.64 appears a fair figure to me and, therefore, I will use this figure as my fair value EV/FCF valuation. This I then multiply using my predicted FCF per share figure. 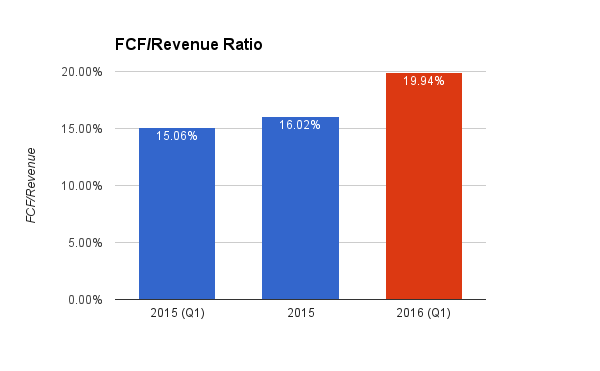 I calculate my predicted FCF figure by using a weighted historic FCF/Revenue figures (see my previous article for more detail on how). Using this gives me predicted FCF figures of $546 and $563 million. Averaging these and multiplying by the EV/FCF fair value figure provides us with a fair value of $87.37. 15.52%, therefore, seems too conservative to my mind. 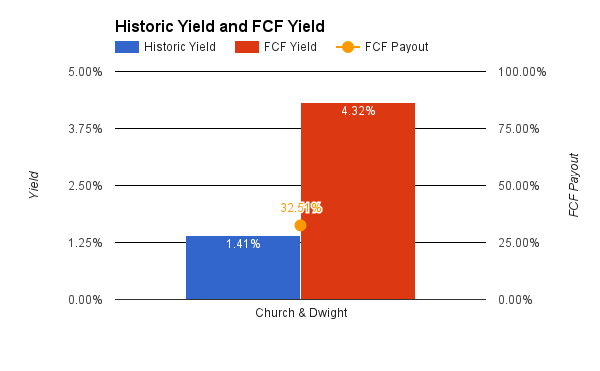 I am going to use 18% as a fairer reflection both of Church & Dwight's historical FCF/Revenue conversion and future potential based on Q1 2016 results. 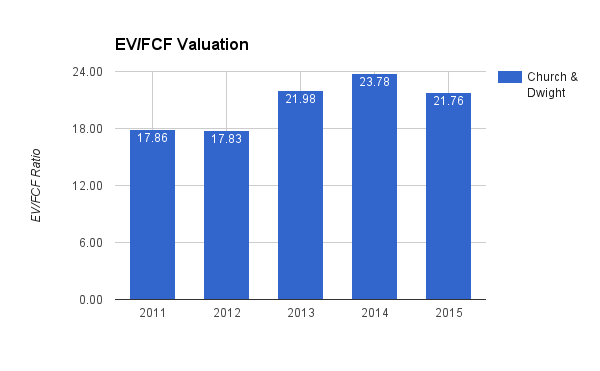 Doing so and using the previous 20.64 EV/FCF ratio suggests a potential FCF fair value of $101.33. Church & Dwight, from this perspective, looks either overvalued or modestly undervalued depending on which FCF/Revenue you prefer. Church & Dwight, from this analysis, looks between 2% and 8.5% overvalued at present. Averaging the basic and adjusted prices would suggest a price of $90.96 as a compromise fair value. All told, despite its massive attractions, Church & Dwight still looks fairly heftily overvalued judged by its recent history. Yet, should the price moderate to around $91 to $94 I would certainly be happy to open a small pilot position. Should it drop below the $88 mark, I'd be quite content to build up a fuller position. Church & Dwight remains a compelling consumer company with what appears to be robust long-term growth prospects. Yet if you don't already have a holding in the company, patience will have to be exercised for now to get a good entry price. Hopefully I won't have to "keep on waiting" for a point where I am happy to open a holding in this appealing, growing consumer goods company. Unless otherwise stated, all graphs and the calculations contained within were produced by the author.